The two essays in Verso’s edition of Immanuel Wallerstein’s Historic Capitalism with Capitalist Civilization offer an accessible introduction to the multi-volume The Modern World-System (currently at four volumes with two more to come). Heavily influenced by Marx and Fernand Braudel (see earlier post on Jamesons’ Postmodernism) Wallerstein espouses world-systems analysis to interpret long-term trends in sociology, economics and politics. Seeing the development of the capitalist system (beginning in the late fifteenth century) as damaging to the majority of the world’s population, Wallerstein argues that historical capitalism has inevitably reached a structural crisis and that its demise is inexorable. The following paragraph from a book published in 1983, seems prescient when read almost thirty years later. Historical systems however are just that – historical. They come into existence and eventually go out of existence, the consequence of internal processes in which the exacerbation of the internal contradictions lead to a structural crisis. Structural crises are massive, not momentary. They take time to play themselves out. Historical capitalism entered into its structural crisis in the early twentieth century and will probably see its demise as a historical system in the next century. Progress is not inevitable. We are struggling for it. And the form the struggle is taking is not that of socialism versus capitalism, but that of a transition to a relatively classless society versus a transition to some new class-based model of production (different from historical capitalism but not necessarily better). The choice for the world bourgeoisie is not between maintaining historical capitalism and suicide. It is between on the one hand a ‘conservative’ stance, which would result in the continual disintegration of the system and its resultant transformation into an uncertain but probably more egalitarian world order; and, on the other hand, a bold attempt to seize control of the process of transition, in which the bourgeoisie itself would assume ‘socialist’ clothing, and seek to create thereby an alternative historical system which would leave intact the process of exploitation of the world’s work-force to the benefit of a minority. The argument is compelling and I will, at some point, tackle Wallerstein’s The Modern World-System but intend to first read Giovanni Arrighi’s The Long Twentieth Century: Money, Power, and the Origins of Our Times. Arrighi, a collaborator with Wallerstein, also uses the world-systems analytical model. 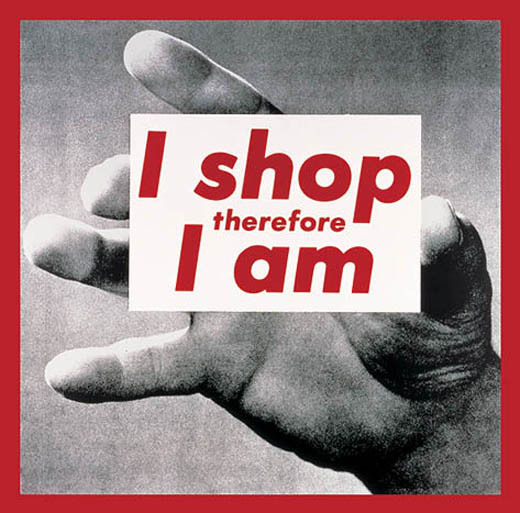 This entry was posted in Barbara Kruger, Fernand Braudel, Giovanni Arrighi, Immanuel Wallerstein, Karl Marx by Anthony. Bookmark the permalink.